You won’t get your players to spend their experience on anything during a session if it isn’t burning a hole in the table right in front of them. One glazed doughnut sits on a desk directly in your line of sight. You’re going to eat it. The bar has a bowl of peanuts and other salty snacks for free, so you eat those – and grab a beer to wash it down. The bakery has a bowl of delicious cake cut into little cubes. You taste a couple and decide to buy some cake to take home. You pop into the services to get a cup of coffee; before you know it you’ve spent a pocket of change on the gaming machines. Temptation is in the eye of the beholder. They know it, so they show it. If someone wants to to spend money or buy something unhealthy, they put it squarely in view. That’s why in games that use experience as a currency – like Cypher System or Symbaroum – you find that player’s save it all up and shrug their shoulders when offered the chance to use it for anything but advancement. You might think that’s a good idea, but what if you’re running the game as a one-off? What’s the point of saving money for advancement with a character you will never use again? The core rules contain a multitude of references to spending Experience, normally a single point and often as an alternative to Corruption expenditure. In most cases, a GM will need to decide before running the game whether either economy should exist in their campaign. Some GMs will be comfortable with the idea, while others will see the spending of points like this as undermining the grit of the setting. Perfect Defense – Parry or dodge successful attack, whether physical or social, that would cause harm or have a negative consequence. Usable once per turn. Prepared – Possess a mundane item or piece of lore (previously unaccounted for or unrecorded, but not unreasonable to possess), that provides a +1 on relevant non-combative tests for the rest of the Scene. While there are plenty of ways to spending a point of Experience, what could you get for a few more? What if you pay it forward and make a small investment – a little like a pre-payment or an insurance – and get something for the rest of the game session. Does that make sense? It would be less than a Boon, but more than a re-roll. To take a term from the Cypher System, it’s a temporary Asset. For example, your group enter the mountains and it becomes clear that knowing the local dwarf families would be a strong advantage. No one has a suitable Contact trait, so the barbarian hunter player spends 3xp to acquire a connection for the rest of the session (or maybe the adventure). 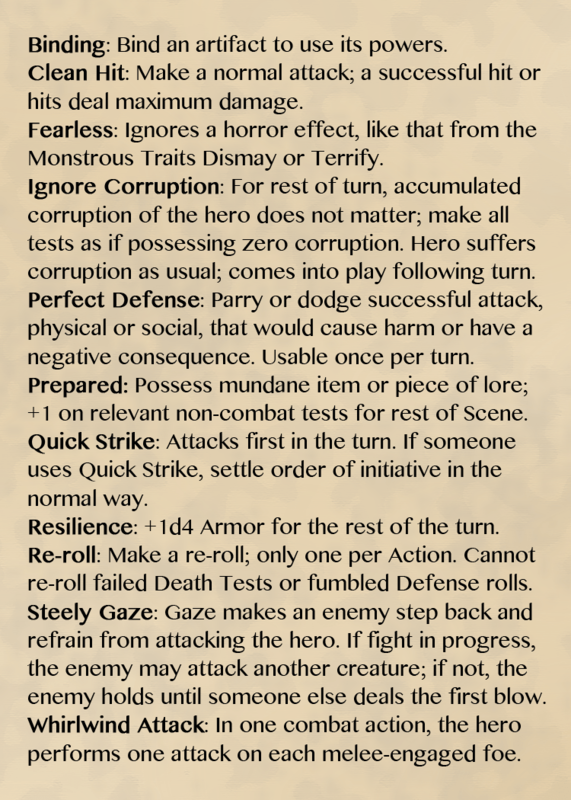 It will also have the effect of a +1 on any interaction of importance where the player needs to make a test; otherwise, the character will have positive relations and reactions where a test doesn’t matter. Essentially, the GM needs to work this sort of thing out – how long the effect last – because only they have a handle on how long they run their game! A four hour session, for example, would be about right. You might get a whole small adventure done in that time and if the characters all go wandering around the mountains, that Contact with the local dwarf family might be significant and useful. When it comes to spending Experience at a later date, a GM who desires more connectivity between Experience spent and Abilities or Traits gained could look more favourably on a player who bought something similar as an Asset in an earlier adventure. While the temptation with using the Boon and Burden system included in the Advanced Players Guide might be to take one of each and have them cancel each other out, you might just opt to take the extra Experience Points for a Burden. Nightmares might keep your character awake all night, but you’re halfway to the next Ability and you have a little give when it comes down to re-rolls. Yes, it’s not likely, as some of those Boons can be quite handy, but if nothing quite fits your character vision, then why pick something just because. I would suggest that adding these little bits of focus later on shouldn’t be an issue – a GM and player should have the option to come away later and agree that a certain Boon might have been hidden before now. It might be simpler with some than others, but even the weird stuff might be triggered like a mutant superpower rather than obvious from the outset. How do you achieve the line of sight effect that I alluded to at the start of the article? I would suggest putting the Experience in front of the players. I’m not talking about recording it on their character sheet, but physically handing the player a point of Experience. You can achieve with a playing cards, a poker chip, a foiled wrapped confectionery, a plastic game piece or whatever you have enough of and to hand. Make sure you have assessed the adventure before hand, totalled the number of scenes and multiplied by the players attending – that’s how many things you need, more or less. Say we’re running an average eight (8) scene adventure with four (4) players – you need to bring at least 24 tokens. I would suggest a few more than that, for ad hoc awards. You don’t need experience for every scene, as those awarded for the final challenge will come right at the end of the game and the players won’t have time to spend them in the game itself. Why should you ignore the Core Rules and hand the players Experience tokens like this during the game? Because if you don’t they won’t think to spend them. If you hand them the Experience at the end of the game, they will save it for improvements. Even if they don’t, they’re unlikely to remember to spend them next time either, even though they have them waiting in an available pool. The character sheet might be in front of them, but that isn’t the same as line of sight. A picture of chocolate might make you hungry, but you’re unlikely to get up and leave the house to go buy it. If the chocolate sits in a bowl on the table in front of you, that’s another matter – and the same principle applies to Experience points. As noted, this applies doubly so for one-off games, demos and convention games – the player won’t be back, so give them the Experience right away and allow them to spend it productively. Even the players with a little more willpower and a master plan about their characters long term development will be more tempted to spend Experience on a re-roll if it’s sat right there in front of them. They’ll see it, they’ll touch it – and they’ll be of a mind to spend it in the heat of the moment. Excitement does that to people.